Yarns are linear structures that are formed by collecting and twisting fibers together. Converting fibers into yarns is a necessary step for weaving or knitting fabrics. 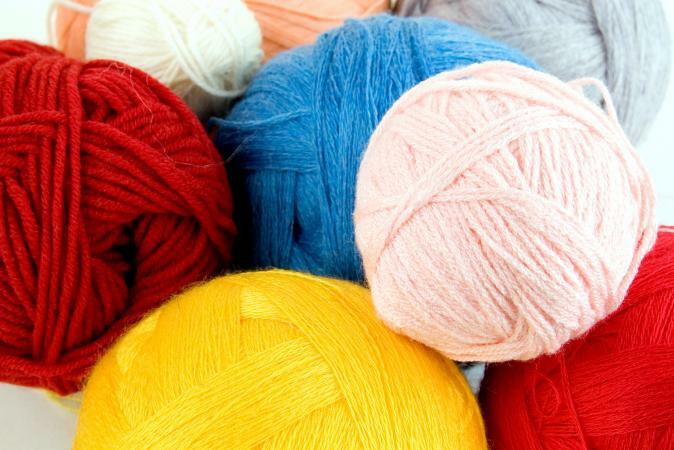 Yarns can be classified in a number of ways: by type, size, number of parts, or similarity of parts. These classifications determine the specification of yarns for enduse textile products with different properties. Yarn structure can affect fabric strength, appearance, comfort, feel or hand, and drape among other properties. The two main types of yarns are staple and filament. Staple yarns, also called spun yarns, are made of fibers that come in short discrete lengths. All natural fibers except silk are staple fibers. Filament yarns are collections of long continuous filament fibers. Silk is such a fiber, and manufactured fibers are produced in filament form. The manufactured filaments can then be cut into staple lengths if staple yarns are desired. Staple fibers are formed into yarns by a series of processing steps that have been developed over time for specific fibers. 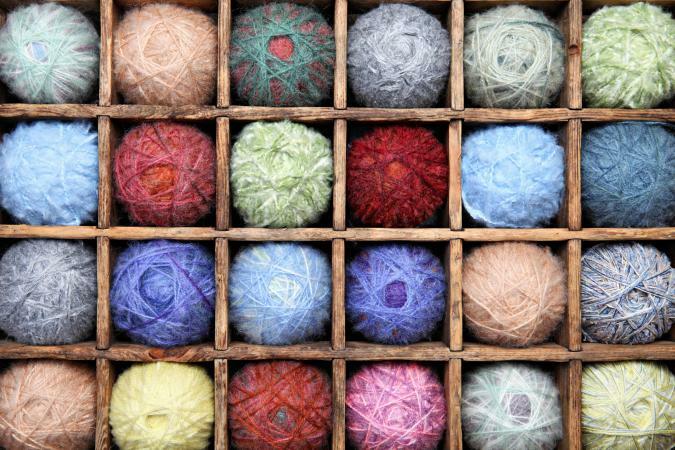 Cotton, wool, and linen yarns all have their distinctive processes. The cotton system is the most commonly used, for both cotton and cotton-blend yarns. In the cotton system, fibers from bales are first run through rollers with spikes to pull the clumps apart, and are then further separated in an opening and cleaning step where trash is removed. This is followed by carding, in which the fibers are passed through fine wires or pins to individually separate and align them. They emerge as a loose collection of aligned fibers known as a sliver. The sliver can then be combed, an optional step in which the carded fibers are pulled through fine combs to remove shorter fibers and arrange the longer fibers into a parallel form. Cotton fabrics made from these yarns are smooth and soft and often labeled "fine combed cotton." As can be imagined, combed cottons are more expensive than yarns that are carded only. After several processes in which the carded or carded and combed fibers are drawn through rollers, they are slightly twisted to form a soft rope called a roving. The roving is tightly twisted in the final spinning step. Preparation of wool fibers for spinning is similar. Fibers that are carded only are formed into woolen yarns, which are soft and bulky. Worsted yarns, on the other hand, are combed and also subjected to a special drawing process, gilling, where pins help to straighten the fibers. Worsted yarns are more tightly twisted in the final spinning step, making them smoother and more compact in appearance. There are several techniques for inserting the final twist in staple yarns. Ring spinning is the most mature spinning method. The yarn is wound on a bobbin or spool that rotates at a high rate of speed. The rotation twists the loose rope of fibers into a strong yarn. Ring spinning gets its name from a ring that travels up and down the spindle. A small clip, the traveler, holds the yarn and moves around the ring. Ring-spun yarns are smoother and stronger than yarns made by other spinning techniques, and can also be made in finer sizes. Ring spinning is slower and therefore more expensive than other methods, prompting garment makers to identify ring-spun yarns in products such as cotton underwear and T-shirts. Another process for twisting staple yarns is open-end spinning. In its most common manifestation, rotor spinning, the fiber roving is carried by an air stream into a rapidly spinning rotor with a V-shaped groove. The fibers are deposited by centrifugal force in the groove and then drawn off through a center delivery tube. The operation bears some resemblance to a cotton candy machine. As the fine candy fibers are formed they are caught and collected. In rotor spinning, fibers are caught by the "open end" of a previously formed yarn and the rapid rotation of the rotor twists the yarn. Rotor spun yarns are more uniform than ring-spun yarns, but not as strong. In addition, they cannot be made in very fine sizes. Most cotton yarns for denim are rotor spun. Friction spinning is another open-end method. A mixture of air and fibers is fed between two drums rotating in opposite directions. This inserts twist into the fibers, much as spinners did in ancient times by rolling clumps of fibers between their fingers. An increasingly popular spinning method is air-jet spinning. Yarns are formed by jets of air forcing the outer layers of fibers in a sliver to wrap around the interior fibers. Air-jet yarns are weaker than ring or open-end spun yarns, but can be made in finer sizes. Filament yarns are made by gathering together long continuous fibers, with or without inserting twist. Filament yarns produce fabrics that are smooth and slippery to the touch. They are also stronger than staple yarns, which is why before the discovery of synthetic manufactured fibers parachutes were made of silk. Because of their value, the parachutes used during World War II were often retrieved by civilians and made into garments. Filament yarns are also associated with luxury fabrics such as satin and velvet, which were traditionally made with silk filament yarns. To change their properties, filament yarns can be textured or "bulked." This makes them softer, stretchier, more resilient, and more like staple yarns. Textured yarn fabrics are also more permeable to moisture and air, increasing the comfort to the wearer. Common texturing methods are: false twist, in which the yarns are twisted, heated to set the twist, and then untwisted; and air jet, in which the slack filaments in the yarn are entangled and formed into loops by jets of air. False twist imparts stretch as well as the look and feel of staple yarn fabrics. Air jet yarns are soft and bulky but have little stretch. The polyester double-knit fabrics of the 1960s were made of textured filament yarns. Over the years different systems have emerged for designating the size of textile yarns. The oldest systems are "indirect," in that the higher the number is the smaller, or finer, the yarn. Cotton count is an indirect system for specifying the size of cotton and cotton-blend yarns. It is the number of 840-yard lengths of yarn in one pound. As spinning processes were developed for wool and linen, specific yarn numbering systems were created for these fibers, differing in the lengths that are specified per pound of yarn. These indirect systems for yarn size were based on English measuring units (yards, pounds); the move toward universally accepted metric units has resulted in yarn numbering systems in which the yarn count varies directly with the size. Tex is the weight in grams of 1,000 meters of yarn, while denier is the weight in grams of 9,000 meters. Tex is the more general term as it can be used for sizing both staple and filament yarns. An understanding of the relative sizes of yarns can be used to determine appropriate end-uses for fabrics. Properties such as strength, smoothness, drape, and wrinkle resistance are affected by yarn size. For example, heavier yarns are used in denim fabrics for jeans and pants because both strength and some degree of wrinkle resistance are desired. Cotton blouses and shirts, however, would require smaller yarns for a smooth comfortable feel. Yarns can be single, ply, or cord. Single yarns are made from staple or filament fibers twisted together. Ply yarns are two single yarns twisted together. They are stronger and smoother than singles. Most sewing threads are ply yarns. The strength and smoothness help the threads withstand the friction and mechanical action during sewing. Twisting two or more ply yarns together forms cord yarns, which are stronger still. Cords are mostly destined for industrial uses such as cables and ropes, although they can be used in apparel for different effects and textures. If all parts of a yarn, be it single, ply, or cord, are uniform in size and have a regular surface, the yarn is termed a simple yarn. Varying the structure of one or more of the parts of a yarn produces a novelty yarn. An example of a novelty single yarn is a crepe yarn, which is over twisted to yield kinks and an irregular surface. A great variety of novelty yarns can be made by plying two dissimilar singles or twisting similar singles in an irregular structure. In a bouclé yarn, one ply (the effect yarn) forms irregular loops around the base yarn. Ratiné yarns are similar in structure, but the loops are regularly spaced along the yarn. The loops are visible in fabrics made with bouclé or ratiné yarns. Another variation of this is twisting the effect yarn irregularly around the base yarn so that it creates knots or nubs in some places. These are called knot, spot, or nub yarns. Varying the degree of twist along single or ply yarn produces thick soft "slubs" in the yarn. Slub yarns show these irregularities in the fabric; one such fabric is shantung, often made of silk. Spiral or corkscrew yarns are made of two plies, one of which is heavy and soft, winding around a finer core yarn. Chenille yarns are different from other structures in that a fabric is first woven, then cut into strips that form the yarn. The strips have fiber ends sticking out on all sides and the yarn resembles a caterpillar. These fluffy ends protrude in fabrics containing chenille yarns. Color can be used to produce or enhance novelty effects. In plied yarns for example, single yarns of different colors can be twisted together. This effect is enhanced in bouclé, ratiné, or corkscrew yarns. Tweed fabrics are made from novelty single yarns; the novelty lies in combining different colored fibers in a single spun yarn. Blended yarns, which contain mixtures of fibers, have several purposes. Self-blending is done to more thoroughly mix fibers, particularly natural fibers, from different sources. This minimizes the possibility of concentrating fiber defects in one section or batch of yarn. Another purpose of blending is to combine the properties of different fibers, for example the comfort and absorbency of cotton with the strength and wrinkle resistance of polyester. Cotton-polyester blends are popular fabrics and are usually made by mixing the fibers at some stage of processing. Fibers can be blended when bales or boxes are opened and cleaned prior to carding. They can also be mixed by drawing several slivers together. Repeated drawing of blended slivers enhances the mixing. Yarns for Harris tweed fabrics are made by blending different colored wool fibers in large chambers supplied with air streams, prior to carding. See also Spinning; Spinning Machinery; Wool. Demir, Ali, and Hassan Mohamed Behery. 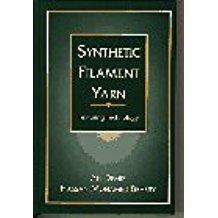 Synthetic Filament Yarn. Upper Saddle River, N.J.: Prentice Hall, 1997. Goswami, Bhuvenesh Chandra, J. G. Martindale, and F. L. Scardino. Textile Yarns: Technology, Structure, and Applications. New York: Wiley-Interscience, 1977.